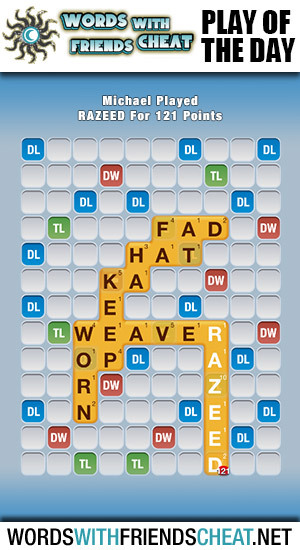 Today’s Words With Friends – Play Of The Day is RAZEED (121pts) and was submitted by Words With Friends Cheat user Sequester. Sequester combined a lax play by her opponent with the perfect letters to hook the word WEAVER and drop RAZEED all the way down the board to the Triple Word score. She hit the Triple Letter tile with the Z, which blew the play up to a hefty 121 points. RAZEED: A ship, especially a warship, reduced in height by the removal of the upper deck.